Yep, sounds like the display unit is tranlsating decimnal to binary.... But since all the logic internally will be binary, I would imagine it will translate 0008 to 1000. Sounds like a bit of a non-issue, in light of the new shiny toy. The old 3V system will be up for sale shortly, along with several beerspheres. I just used a stock pot to heat the sparge water today, will see how it goes and if I need an hlt. Boil underway, lunch next then after the brew is finished I will have another look at the c100. Hairybiker wrote: The old 3V system will be up for sale shortly, along with several beerspheres. I just used a stock pot to heat the sparge water today, will see how it goes and if I need an hlt. How did the grainfather go? I was in my LHBS the other day, they tried to sell me one! Also, I'm itching to know if the C100 was unlocked using decimal conversion of the binary codes? Last time I ask, I'd just love to know! Sorry completely forgot about it. On hols in Yorkshire now (piddling down here compared to 25C yesterday) so wont get to check it till next week. GF was excellent, very easy to use and clean after. only hassle is lifting the malt tube to sparge. The hop "tea bags" had issues in that 2 of the 3 them split and one pasted itself on to the filter causing a slow down. But the chiller was great, straight to the FV @18C from the 80C hop steep. OK just tried 0008, still no luck on it. Ah, nevermind... Could be anything i guess. First 16 starting at zero would correspond... There comes a point where its nothin but a complete was of time! Mind you some would say that of our wonderful hobby, but we know better! Hi, I just wanted to say thanks to ockelford for this, I've just added HERMS to my setup with a new PID and this has saved me a load of trouble trying to work out how I set up my HLT PID. +1 on the thanks for the guide, I have now built my hlt controller box and it works beautifully! At the moment it's 1c out so a slight play with the settings and I'll be good to go! cononthebarber wrote: +1 on the thanks for the guide, I have now built my hlt controller box and it works beautifully! Hi there, glad it helped, as much as anything it was writing it up to get all the info in one place, in case I needed it again for myself in the future, but its good to share I guess. 1) I hadquite large unpredictability outside of 10 degrees either side of the temperature I calibrated at. 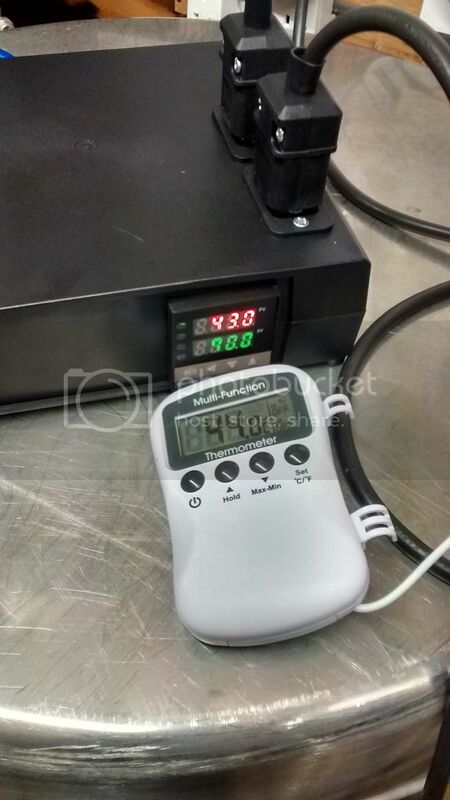 2) Get a decent digital calibratable thermometer - I went for a Comark PDQ400 in the end, was correct at freezing and in Steam, so I reckon I can trust it. Hope this helps - incidentally - how does your temp sensor fair at temps different to the calibrating temp? SHL and SLL normally limits the set point of the process variable and nothing else. It has no impact on accuracy apart from stopping you the operator selecting an unachievable PV. Also it's better to calibrate close to the valve you are using it at if possible.